Environmentalists led by zillionaire activist Tom Steyer have already begun politicking in Colorado to return the state Senate to the Democratic Party of which they serve. Complete Colorado reports that campaign flyers targeting state Senator Laura Woods were mailed to her voters claiming she was out of touch with California Colorado voters. The special interest groups also claimed Woods was in the pocket of special interest groups, presumably not the same ones. According to Complete Colorado, the money is being funneled through Fairness for Colorado that is funded by Conservation Colorado and is closely tied to Steyer, and America Votes that boasts as one of its members NextGen Climate, which is Steyer’s PAC. The environmental group (Conservation Colorado) even held an awards dinner in Steyer’s honor last year, where the California billionaire called the 2016 election “critical.” He also warned there is “even more at stake” this year than in 2014, when he poured millions of dollars into a botched effort to save Udall. He’s right about one thing, there is more at stake this year — control of the legislature, control of the U.S. Senate with Michael Bennet’s election, and the White House. 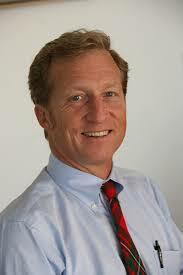 It’s no wonder Steyer is determined to turn out Colorado Democrats to $wing this state in their favor. Conservation Colorado and it's predecessor groups have been fixtures in Colorado for decades, far longer than CO Peak Politics has been around. Laura Waters Woods is a nutjob.